And they say the C5 is slow !!!!!!!!!!!!!!!!!!!!!! Look at the size of that ! Mobile coconut shy, first one to knock his hat off gets a pound! And its illegal to use a Segaway in this country ? I like the sound of a Segaway, does it play megadrive games? Some more on this one ! That is what looks like a stupidly over-specified, hence unecessarily expensive, and unweidy device. 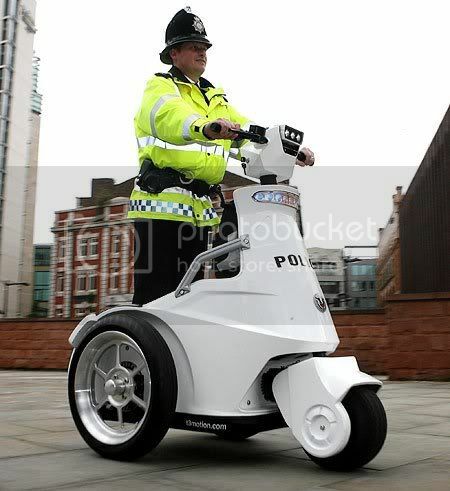 Some US Police forces use electrically assisted bikes in downtown areas with great success:they were offered to the UK government over a decade ago but they were rejected as being too powerful were motorcycles by Construction & Use definitions. These were cheap to buy, cheap to run, ecologically sound,practical, but our Government wouldn't adapt the laws.Instead our police use very expensive mountain bikes, I know what the Police pay for them. Or is it just to drive between pedestrians, kind of lazy cop attribute?